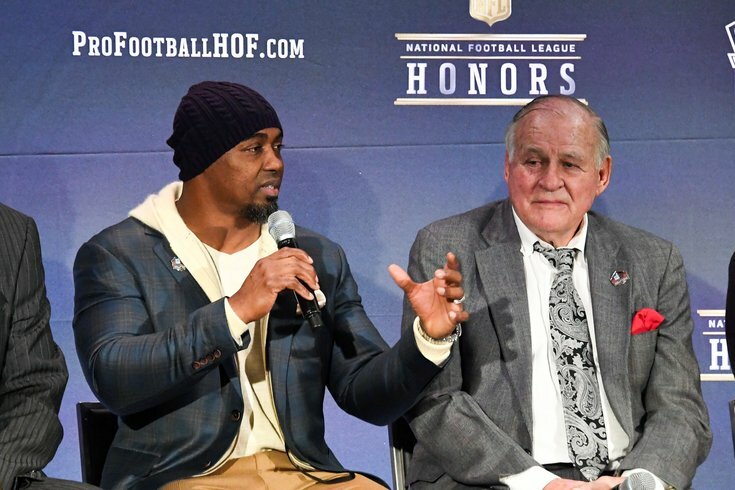 Former Eagles safety Brian Dawkins, left, was voted into the Hall of Fame in February. Philadelphia Eagles legend Brian Dawkins, who was voted into the Pro Football Hall of Fame early this year on the same weekend the Eagles won their first Super Bowl and has been known to inspire fans to run through concrete SEPTA poles, has announced that he will be stepping down from his current full-time role with the team to pursue other entrepreneurial and philanthropic endeavors. But don't worry, this isn't anything like the last time Dawkins left Philly, when he was unceremoniously traded to the Broncos toward the end of his career. The 16-year NFL veteran safety, after spending two years as member of the football operations department, will remain with the team as a consultant. "I want to thank Jeffrey Lurie, Howie Roseman, Don Smolenski and Coach Pederson for blessing me with the opportunity to return to this great organization," Dawkins said in a statement. "This is a special time in Philadelphia Eagles history and I am grateful to have been a part of the team’s first Super Bowl Championship – something I wanted to help bring to this great city, one way or another. I will always cherish the relationships I have within the building and it was a privilege to work side-by-side with so many great people. "I have put a lot of time in prayer into this decision, and after talking it over with my family and listening to the Lord, I am being called in a different direction as I take the next step in my life and career. Although I am leaving my full-time role in football operations, I will always be a part of the Eagles family and the Philadelphia community. I look forward to continuing to work with the organization as a consultant while I also pursue other endeavors that are extremely important to me and my family’s purpose to inspire hope and increase the minds, bodies and souls of so many to come." Dawkins, who spent 13 seasons with the Eagles as a player, left the team as the all-time leader in interceptions (34) games played (183) and is one of just five players in NFL history to record at least 30 interceptions and 20 sacks in his career. "Brian Dawkins will always be a Philadelphia Eagle," the team said in a statement. "We greatly appreciate all of Brian’s contributions to our football operations department over the last two seasons and we are excited that he will continue to help us going forward. As an NFL Hall of Famer and a Philadelphia Eagles legend, Brian is able to provide valuable perspective and draw on his extensive experience in the NFL while working in our front office. "Our doors will always be open to him and we will support him in anything he does – both professionally and personally – as he continues his post-playing career." Dawkins, who was voted the greatest living Eagle by PhillyVoice readers back in 2015, will be inducted into the Hall of Fame in Canton, Ohio, this summer. And you might want to set your DVRs now, because that speech is going to be one for the ages.